Self regulation is one of those things no one notices it until its not there. Many children with Sensory Processing Disorder and other special needs lack self-regulation. So what exactly is self-regulation? And how do you help your child get it? Simply put, self-regulation is your ability to control your behavior and respond appropriately to your immediate situation. (It’s actually a lot more than that, and much more complicated, but that’s the part of it that this post focuses on!) We are all born with very limited self-regulation, and our early childhood years are spent developing it. If you have young children, you see examples of children developing self-regulation skills every day. Remember the play date when your toddler’s friend tried to play with one of her very favorite toys? If your toddler said something along the lines of “Here you go Sally, I share my toy,” you need to do three things: pat your self on the back, give thanks to Jesus, and click away from this post, ’cause you’ve got it figured out! If your child screamed “MIIIIIIIIIIINNE! NOOOOO!” at the top of her lungs, well, that’s pretty much typical self- regulation for a small toddler. No need to worry, the following suggestions will help foster her ability to self-regulate. Toddlers are notorious for loosing their temper because they don’t have well developed self-regulation, and they won’t until they are around 5 years old. There is a third option: If your child is the one that started crying as soon as you got to the play date (her shirt is too scratchy and the toys are too loud and the sun is too bright and she is too preoccupied with her fear to even consider interacting with another toddler), then these suggestions are for you. Let me tell you friend, not only have I been there, I have lived there. It wasn’t until we started occupational therapy with Elise and I learned what self-regulation was, that I started realizing it was the missing puzzle piece to stopping her meltdowns. And by meltdowns, I don’t just mean typical toddler tantrums. I mean one fit after another, after another, sun up ’till sundown. Sensory meltdowns that lasted hours at a time. I had researched and researched everything to try and help my child stop tantruming, and we did see improvement when I employed other tactics. But the meltdowns still happened until we introduced self-regulation strategies. Since there is no way I can remove all sensory issues from her environment, I started teaching her to calm herself down so that she could at least cope with what was bothering her. She is now two years old and has mastered self-regulation (well, to the fullest extent that a two-year-old can master self regulation…). I am happy to report that it has been over 5 months since she has had a full scale meltdown. Yes, she still has sensory-related meltdowns, but they usually last a maximum of 3 minutes, instead of 3 hours. And yes, she still has typical toddler tantrums, but they are short, sparse, and totally age-appropriate. This is more than I could have ever dreamed of for her, and I owe it all to self-regulation. So here it is….this is the list of things that worked for us and I hope they help you too! Something that has to happen before your child can self-regulate is co-regulation. Have you ever been going about your happy little day and then find yourself running into a Negative Nellie? Someone so negative or stressed that you suddenly found yourself feeling negative and stressed? You just experienced co-regulation. Co-regulation is feeding off of the energy of the people (or environment) around you, and you had better believe your child is doing this. If your child can sense that you are stressed about a certain situation, it can be the green light he needs to go from zero to dysregulated. Children with sensory issues are often more sensitive to the moods of others, which is why it is so important to stay calm for them. One time, during a particularly stressful and meltdown-laden physical therapy session, I remember Elise’s PT remarking to me how patient I was, and how did I always stay so calm? I don’t have super-patient-powers, but I learned the hard way that getting upset or even raising my voice made things worse. If Elise even sensed that I was getting frustrated, her fits and tantruming would sky-rocket out of control. For my own self preservation, I had to stay calm. I know that staying calm while your child’s screams reverberate off the grocery store walls is hard, so I suggest a fake-it-till-you-make-it strategy. Luckily, as long as I speak calmly, move purposefully, and breath deeply, my child doesn’t realize I’m coming unraveled on the inside, and I’ll bet your child won’t either. Children are going to mirror you, so make sure you are projecting something you want them to copy, especially during a meltdown. The absolute hands-down worst time to teach your child self-regulation is when they are not self-regulating. I repeat: Do not try to teach your child how to calm down in the middle of a meltdown. You will fail. Not that I’m speaking from personal experience…. Toddlers mid-tantrum are intense creatures with a singular focus. They do not see logic, and you cannot reason with them, so don’t try. We do not negotiate with terrorists! It might even distress and overwhelm them further and prolong the meltdown. 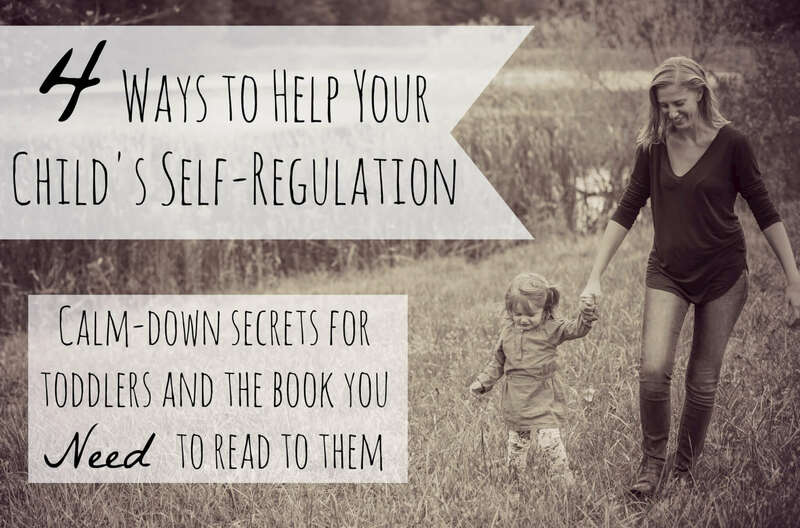 The best time to introduce the topic of self-regulation is when your child is happy and calm. If you can work it into something your child enjoys, do that. For instance, my child loves books and really connects with them, so I try to find stories where the main character deals with whatever behavior I would like to change (More on this in #5). When your child is content and playing with toys, that is when you can talk about the importance of sharing, not when they are screaming because someone took their toy. Choose your moments wisely, and choose them frequently. The more you can work discussion of self-regulation into daily life, the easier it will be for your child to access these strategies in times of distress. This has been wildly successful with our daughter, and its a very important step in diffusing a tantrum–regardless of whether it is behavioral or sensory-related. Acknowledging simply means that you identify the emotion your child is feeling, and help them understand that everyone feels that way sometimes, and its okay. Lets say your child pinches her finger and runs to you upset. A toddler does not have the language capabilities to tell you exactly how she feels in that moment, which can heighten her negative reaction. If saying “you’re okay,” and being dismissive escalates the situation (story of my life! ), there is an alternative. Try saying something like “I’m sorry you’re upset honey, I bet that hurt! I can see that you are sad and scared. Let me give you a hug and sit with you until you feel better.” Remember co-regulation? By letting your child know that you understand, and by staying calm, you can help your child work through the situation. A self soothing strategy is something that helps make the shift from co-regulating (you helping your child calm down) to self-regulating. It can be a technique, like deep breathing, or an object, like a toy. That way, when your child is upset, he can turn to this strategy to calm himself down. Some other examples are singing a special song (make up something catchy! ), cuddling with a blanket, or holding a special toy. Explain to your child while he is calm and happy that this is a special toy (blanket, song, etc) that will help him calm down when he gets sad. Show him just exactly what he is supposed to do and see if he will practice it with you. It might seem silly, and its perfectly fine if you both end up laughing! You want him to associate this strategy with positive emotion, so that it has more power when he is upset. If your child is upset and crying because he didn’t get his way, instead of getting upset, try saying something like this: “It made you angry when mommy told you you couldn’t have another cookie, didn’t it? Do you know what mommy does when she gets angry? Mommy takes a deep breath. Let’s try it together.” It might take a few tries at first, but after a while it will become second nature to you both. Everything about this book is so simple, its just pure genius. It is the story of a monkey who has a rough day and it goes step by step through all the things he can do to calm himself down (self-soothing strategies). Spoiler Alert: using these strategies, the little monkey does calm down and has a fun day with his family. We first started reading it when Elise was around 18 months old, and it was right at her level. Now, when she is upset, we just have to ask her what little monkey would do. As far as an actual tool that you need to have in your arsenal, this book is it! Remember: These ideas might seem slow-going at first, but DON’T GIVE UP! Some of the things that work the best with our daughter didn’t work at all the first time we tried them. You know your child better than anyone else, so pick and choose the response or strategy that works best for them, and try to be as flexible as possible. Also, try to keep age-appropriate expectations. Self-regulation doesn’t fully develop until a child’s 5th birthday, so we can’t expect perfection from our 2 or 3 year old. That being said, if my child can do a 180 like this, I know your child can too! Do you have any calm-down secrets!? Comment and share them with us! This post may contain affiliate links. If you purchase by clicking on these links, I may make a small commission but your purchase price stays the same. Thank you for supporting my blog in this way!